Access to web APIs by native clients and websites in Azure Active Directory (Azure AD) is implemented by using the OAuth 2.0 Authorization Code Grant flow. In this flow, the user delegates access to a client application. The transaction is protected and mediated by a code grant, which is exchanged for an access token. The client application never sees the user's credentials and the user agent never sees the access token. The standard Authorization Code Grant flow is described in Section 4.1 of the The OAuth 2.0 Authorization FrameworkThis diagram shows how the Authorization Code Grant Flow works in Azure AD. The following diagram illustrates the Authorization Code Grant flow. The client application starts the flow by redirecting the user agent to the Azure AD authorization endpoint. The user authenticates and consents, if consent is required. The Azure AD authorization endpoint redirects the user agent back to the client application with an authorization code. The user agent returns authorization code to the client application’s redirect URI. The client application requests an access token from the Azure AD token issuance endpoint. It presents the authorization code to prove that the user has consented. The Azure AD token issuance endpoint returns an access token and a refresh token. The refresh token can be used to request additional access tokens. The client application uses the access token to authenticate to the Web API. After authenticating the client application, the web API returns the requested data. Next, the application prompts the user to authenticate to Azure AD and to allow Azure AD to release an authorization code to the application. The application presents the authorization code to an authorization server and the authorization server returns an access token that gives the application permission to access the resource. To get the authorization code, the web browser (or an embedded web browser control) navigates to a tenant-specific or common (tenant-independent) endpoint. The following table describes the valid parameters in the request. [Required] Specifies the client id of the application that is registered in Azure Active Directory. To find the application's client ID, in the Azure Management Portal, click Active Directory, click the directory, click the application and then click Configure. [Optional] Provides a hint about the tenant or domain that the user should use to sign in. The value of the domain_hint is a registered domain for the tenant. If the tenant is federated to an on-premises directory, AAD redirects to the specified tenant federation server. [Optional] Provides a hint to the user on the sign-in page. For example, this value is pre-filled in the username field on the sign-in page. [Optional] Indicate the type of user interaction that is required. -- login: The user should be prompted to re-authenticate.-- consent: User consent has been granted, but needs to be updated. The user should be prompted to consent. -- admin_consent: An administrator should be prompted to consent on behalf of all users in their organization. [Recommended] Specifies the reply URL of the application. To find the application's reply URL, in the Azure Management Portal, click Active Directory, click the directory, and then click the application and then click Configure. The Reply URL field is in the Single Sign-on section of the Configure page. [Optional] The App ID URI of the web API (secured resource). To find the App ID URI of the web API, in the Azure Management Portal, click Active Directory, click the directory, click the application and then click Configure. [Required] Specifies the requested response type. In an authorization code grant request, the value must be code. The following are examples of valid GET requests for an authorization code. In this request, the application with client_id 2d4d11a2-f814-46a7-890a-274a72a7309e requests an authorization code. The authorization code will be used to request a token for the web API with the resource identifierhttps://service.contoso.com/. Because the expected user is admin@contoso.com, this value used in a login_hint that is prefilled in username field on the sign-in page. The redirect_uri value in the request is the registered redirect URI for the application. When the application runs on the user’s device and is not hosted on a website, the redirect URI does not need to be a physical endpoint. The following example is similar to the previous one, but it uses the domain_hint parameter to suggest a domain and the prompt parameter to specify a consent prompt. When an application sends a GET request for an authorization code, Azure AD sends a response to the value of the redirect_uri parameter in the request. The response includes the following parameters. The value is True if an administrator consented to a consent request prompt. The authorization code that the application requested. The application can use the authorization code to request an access token for the target resource. A unique value that identifies the current user session. This value is a GUID, but should be treated as an opaque value that is passed without examination. If a state parameter is included in the request, the same value should appear in the response. The application should verify that the state values in the request and response are identical. For more information, see Best Practices for OAuth 2.0 in Azure AD. The following is a sample response to an authorization code request. The location header value matches the redirect_uri value in the request. If the state value in the response matches the state value in the request, the application should store the authorization code for use in the access token request. 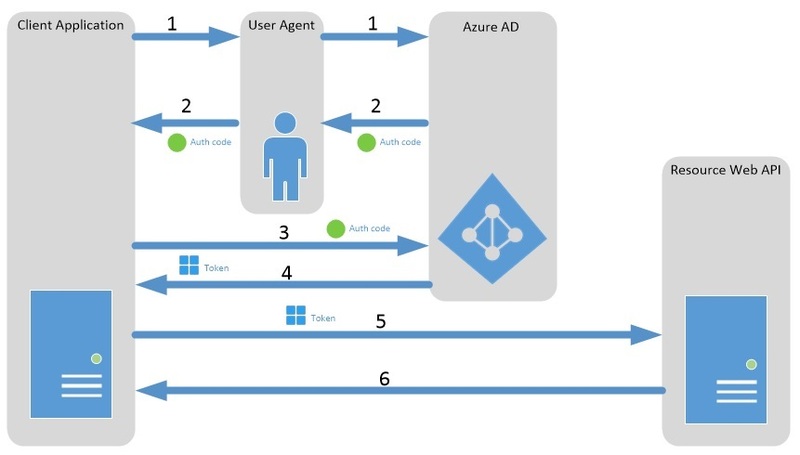 When the application gets the authorization code from the authorization endpoint, it can use the authorization code to request an access token from Azure AD. To redeem an authorization code and get an access token, sent an HTTP POST request to a common or tenant-specific Azure AD Authorization endpoint. The following parameters are valid in a token request. [Required] The client ID of the native client application. [Required for confidential clients (websites)] Contains the client password. [Required] The authorization code from the aeab0a46-4da1-4300-be9c-3be418f07a5b#BKMK_authorization_code_response. [Required] Indicated the type of grant you are using. For an authorization code grant, the value is authorization_code. [Required if it was included in the authorization code request] Specifies the reply URL of the application. The value must match the value of the redirect_uri parameter in the authorization code request. To find the application's reply URL, in the Azure Management Portal, click Active Directory, click the directory, click the application, and then click Configure. The App ID URI of the web API (secured resource). To find the App ID URI, in the Azure Management Portal, click Active Directory, click the directory, click the application, and then click Configure. If resource was not specified when requesting an authorization code, resource must be specified. Otherwise, resource is optional. The following HTTP POST request includes all required parameters and the optional resource parameter. The response to a request for an access token includes the following parameters. The requested access token. The application can use this token to authenticate to the secured resource, such as a web API. How long the access token is valid (in seconds). 1970-01-01T0:0:0Z UTC until the expiration time. This value is used to determine the lifetime of cached tokens. An unsigned JSON Web Token (JWT). The application can use this token to request information about the user who consented. The application can cache the values and display them. An OAuth 2.0 refresh token. The application can use this token acquire additional access tokens after the current access token expires. Impersonation permissions granted to the client application. The default permission is user_impersonation. The owner of the secured resource can register additional values in Azure AD. Indicates the token type value. The only type that Azure AD supports is Bearer For more information about bearer tokens, see The OAuth 2.0 Authorization Framework: Bearer Token Usage (RFC 6750). The id_token parameter value is a JSON web token (JWT) that includes the following claim types. For more information about JSON web tokens, see the JWT IETF draft specification at http://go.microsoft.com/fwlink/?LinkId=392344. Audience of the token. When the token is issued to a client application, the audience is the client_id of the client. Expiration time. The time when the token expires. For the token to be valid, the current date/time must be less than or equal to the exp value. The time is represented as the number of seconds from January 1, 1970 (1970-01-01T0:0:0Z) UTC until the time the token was issued. User’s last name or surname. The application can display this value. User’s first name. The application can display this value. Issued at time. The time when the JWT was issued. The time is represented as the number of seconds from January 1, 1970 (1970-01-01T0:0:0Z) UTC until the time the token was issued. Not before time. The time when the token becomes effective. For the token to be valid, the current date/time must be greater than or equal to the Nbf value. The time is represented as the number of seconds from January 1, 1970 (1970-01-01T0:0:0Z) UTC until the time the token was issued. Object identifier (ID) of the user object in Azure AD. Token subject identifier. This is a persistent and immutable identifier for the user that the token describes. Use this value in caching logic. Tenant identifier (ID) of the Azure AD tenant that issued the token. A unique identifier for that can be displayed to the user. This is usually a user principal name (UPN). User principal name of the user. Version. The version of the JWT token, typically 1.0. The following is a sample response to a request for an access token, when the token request includes an authorization code. You can use the access token that is returned in the response to authenticate to a protected resources, such as a web API. Typically, the token is presented to the web API in an HTTP request using the Bearer scheme, which is described in RFC 6750. This specification explains how to use bearer tokens in HTTP requests to access protected resources. When the web API receives and validates the token, it gives the native client application access to the web API. The following example shows a GET request that passes an access token in the request body. The Authorization header indicates that it is a bearer token, which is valid for anyone who possesses the token. When an access token expires, the native client application can use the refresh token to get a new access token. The lifetime of the refresh token is not provided and varies based on policy settings and the time when the authorization code grant is revoked by Azure AD. The application should expect and handle cases when the request for a new access token fails. In that case, it should return to the code that requests a new access token. For details, see Best Practices for OAuth 2.0 in Azure AD. To use a refresh token to request a new access token, use an HTTP POST request to the common (tenant-independent) or a tenant-specific Azure AD endpoint. Use the following parameters in a token request that includes a refresh token. [Optional] The client ID of the native client application that is registered in Azure AD. To find the application's client ID, in the Azure Management Portal, click Active Directory, click the directory, click the application, and then click Configure. [Required] Indicates the type of grant being used. In this case, the value must be refresh_token. [Required] The refresh token that was included in the response that provided the access token. The following example uses a refresh_token to request a new access token. The POST includes the required grant_type and refresh_token parameters, but none of the optional parameters. Typically, this format is used when the original request specified the resource and there's no need to include it again. The following example also uses a refresh token to request an access token. This request includes the resource parameter with a value that indicates the secured resource that the application wants to access. A successful response to an access token request that includes a refresh token includes the following parameters. The new access token that was requested. The remaining lifetime of the token in seconds. A typical value is 3600 (one hour). The date and time on which the token expires. The date is represented as the number of seconds from 1970-01-01T0:0:0Z UTC until the expiration time. A new OAuth 2.0 refresh_token that can be used to request new access tokens when the one in this response expires. Identifies the secured resource that the access token can be used to access. Impersonation permissions granted to the native client application. The default permission is user_impersonation. The owner of the target resource can register alternate values in Azure AD. The token type. The only supported value is bearer. The following is a sample response to an access token request that includes a refresh token.